Well, if no one else is going to do it, I will. I've been sitting on my nomination for too long. I hereby nominate TAC Quick for a GNR. Since my first visit to TAC, I've been back multiple times to continue to explore the Thai menu, lovingly translated by Erik M. Generally I try to order a split between things I've had before and love and new items. The new items invariably become "things I've had and love". This list is getting way too long. From the simple fried chicken to the most complex curries, every authentic flavor at TAC is upstanding, eye-opening, and perfectly pleasing. Chef Andy is dedicated and skilled, and it shows in every single dish. I really can't get enough of the Issan sausage, the minced chicken with preserved egg and fried holy basil, and every salad I've tried. I have brought a handful of friends to TAC and ordered for them from the Thai menu, in spite of their nervousness about it. Everyone leaves with a smile and one friend rated it "one of the best meals I've had in Chicago". I have a hard time arguing with them about this. With every visit to TAC, they climb higher and higher on my list of favorites. Coming Soon: New Thai Menu at T.A.C. And many more mentions if you just search. An enthusiastic thumbs second for TAC Quick. I had the pleasure of trying TAC for the first time a couple of weeks ago, after Steve Drucker enthused about it when I dined with him in Atlanta. Guess I have to go to Atlanta to get set straight. Having perused the profuse info on it here, I was ready and ordered enough food for 14, which the 4 of us gamely worked through. Thanks to LTHforum and particularly Erik's post, I have found great Thai food in this city. I've been to TAC several times now, including a take out run for ten people (ok there were only six of us but we ordered some twelve or so dishes). My friends were as wowed as I was. We didn't really have leftovers. Another no brainer. YES on renewal. jesteinf wrote: Another no brainer. YES on renewal. Having just enjoyed my first TAC Quick experience last week, I wholeheartedly agree. A no brainer. New posts on TAC here and here. TAC and Sticky Rice are my go to places for Thai. Bring a guest and watch them react, it says it all. Yes on renewal. TAC? Duh. Of course it's still a GNR. I tried TAC quick this year for the first time this summer on my way to a Cubs game. Should have stayed there instead of going to the game and would have come out further ahead. Very impressed with the crispy pork dish I had, along with the basil brisket, and thai sausage. Based on my one meal there, I understand the GNR status and concur with it. Even though I find the service here to be increasingly brusk and annoying, their food's still as good as ever and I support renewal. I dream about the food at TAC. Not much more I can say besides their pork neck may be the finest pork preparation in Chicago. I support the renewal. How lucky are we to have such a high level of Thai cuisine in Chicago? Interesting uncompromising food not dumbed down for the masses. For me, a go to place. One of the best among the best. Jazzfood wrote: How lucky are we to have such a high level of Thai cuisine in Chicago? Interesting uncompromising food not dumbed down for the masses. For me, a go to place. One of the best among the best. Couldn't agree with this more. Definitely a "yes" for me on renewal. I'm still mentally savoring my last meal at TAC, even though it was a couple of months ago. Yes to renewal. Though I've only ordered carryout, Tac Quick has taken me to a level of Thai cuisine I had not thought possible. 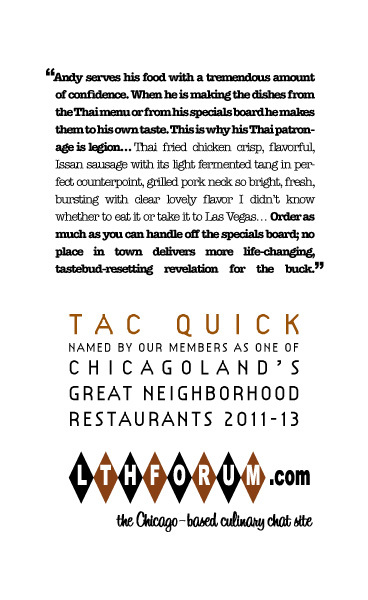 Tac Quick has become my go-to for delicious Thai at a VERY reasonable price, and I endorse this renewal completely. I love TAC Quick and regularly crave their grilled pork neck, crispy on choy, shrimp paste rice, som tom with salted crab, and Thai fried chicken. Big yes on renewal.